Research shows that the bacteria in our gut can influence not just our physical health but our emotions, too. Here’s what scientists advise for a happier, healthier life. 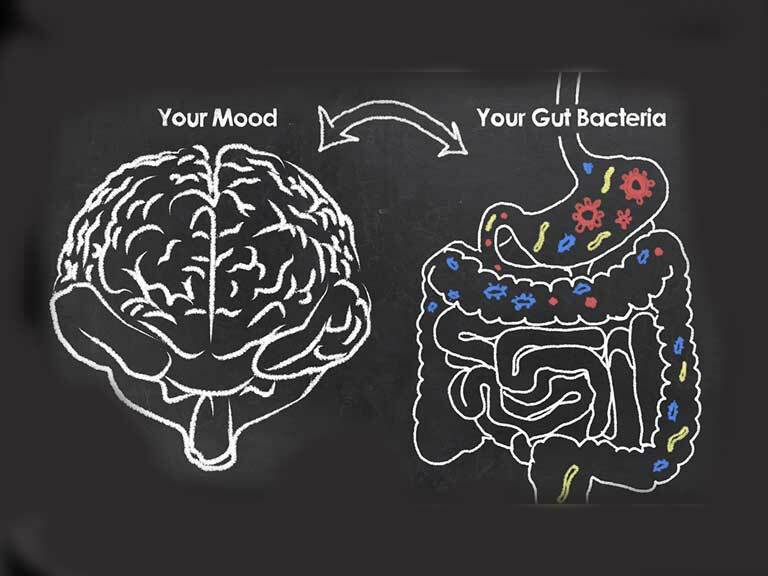 90% of serotonin and 50% of dopamine, both chemicals that are believed to regulate mood, are produced in the gut. We all know what it feels like when the brain sends a message to our gut: our language is full of graphic phrases such as ‘butterflies in the stomach’ or, more disastrously, ‘bowels turning to water’. Now scientists have discovered that it’s a two-way process. A neural network called the enteric nervous system, often referred to as our ‘second brain’, runs the length of our digestive tract and contains many more neurons than our spinal cord. It interacts with a vast ecosystem of bacteria, fungi and yeasts in our gut – the microbiome – to send messages back to the brain. More than 2,000 years ago, Hippocrates said that ‘all disease begins in the gut’ and now scientists are discovering the trillions of microbes there might play as big a role as our genes in influencing not only obesity, immune function, allergies and how we age but also mood and mental health. The gut microbiome contains hundreds more genes than the human genome, and can produce many more chemicals. All the organisms in the microbiome collectively weigh more than the average brain. The entire digestive tract measures about 30ft (9m). Ted Dinan, Professor of Psychiatry and principal investigator in the APC Microbiome Institute at the University of County Cork (UCC), has spent years studying our gut microbiota. ‘The bacteria produce substances we need but cannot make ourselves, such as serotonin, the chemical that some antidepressants affect,’ he says. Professor Dinan also runs a clinic for patients with depression that does not respond to normal treatment. He is working with neuroscientist Professor John Cryan to identify psychobiotics, which are probiotics that have the power to alter our mood. This is an emerging area, but studies are showing certain gut bacteria can reduce levels of the stress hormone cortisol, improve memory and may even affect social behaviour, learning and how we react when we’re fearful. ‘There is good evidence for a number of strains and one of these, Bifidobacterium longum 1714, seems to have a potent anti-anxiety effect – we expect this to be on the market within a year,’ said Professor Dinan. You can read more about the subject in their book The Psychobiotic Revolution. Whether to benefit our mental or physical wellbeing, the key for all of us is to have a huge diversity of microbes in our gut producing thousands of chemicals and compounds that are vital to a healthy metabolism. Unfortunately, our modern diet, lifestyle and increased use of antibiotics has reduced that diversity by a third in the past 50 years. More cheeringly, we can improve it – and we can do this surprisingly quickly. ‘Every food you eat and every drug you take will have an effect on the gut microbiota – it can be changed in as little as three days,’ says Tim Spector, author of The Diet Myth, Professor of Genetic Epidemiology and head of the Department of Twin Research at King’s College, London. He also leads the British Gut Project, which is sequencing the genetics of the microbiome. As an experiment, his son Tom agreed to eat nothing but fast food for ten days when he was a final-year student of genetics. By day six, he felt increasingly sick and lethargic, and after ten days the junk-food diet had reduced the bacterial species in his gut by 40%. Conversely, when Professor Spector spent just three days living with a hunter-gatherer tribe in Tanzania renowned for their good health, his own gut diversity increased by 20% even in such a short time. What should we eat for healthy gut bacteria? To transform our gut microbiome into a super-healthy state, experts advise cutting down on processed and sugary foods, as well as eating more fibre; the part that we can’t digest passes through to our lower intestine and provides sustenance for good gut bacteria. We should aim for a varied diet with some fermented foods such as live yogurt, kefir and sauerkraut, which are rich in gut-healthy microbes such as Lactobacillus acidophilus. The occasional light fast helps. This needn’t be extreme: long gaps between meals are sufficient to prompt a different set of microbes to clean up your gut. We can’t rely on super-healthy gut microbes alone, though. Many studies have shown that vigorous exercise has potent antidepressant benefits – and so does feeling connected, seeing friends and even having hobbies we love. It’s also important to remember that we are all different and this is especially true of our gut. Our bacteria are unique to each of us, so eating the same foods will result in entirely different reactions. For example, two people both drinking an identical glass of orange juice will have different levels of blood sugar as a result. For this reason, says Tim Spector, the future lies in learning how we can tailor our diet to maximise our gut health. His work with the British Gut Project and at King’s College Twin Research has led to the start of what promise to be exciting studies. Although a change of diet works for mainly healthy people, there is a more dramatic treatment for those whose gut microbiome has gone badly awry. Referred to casually in the US as ‘poop-doping’, it’s more politely known as faecal microbiota transplant (FMT), and is being used to treat cases of Clostridium difficile (C diff), a bacteria that infects the bowel, commonly after antibiotic treatment. The transplant is just as it sounds – a sample from a healthy donor’s stool is implanted in the recipient’s colon either via a capsule that you swallow or via a colonoscopy. Might make you grimace, but high success rates have been reported for what is a miserable condition. And it’s proved as good as drugs in treating ulcerative colitis. Obviously, the physical health of the donor has to be carefully screened and now screening the mental health of donors has become equally important. Meanwhile, for the rest of us who’d like to boost our mood as well as our chances of continuing good physical health, the discovery that the gut really does have a mind of its own will give us much food for thought about how we shop, cook and eat. Prebiotics are complex carbohydrates that we can’t digest, but they enable ‘good’ bacteria in our gut to increase. Onions, celery, leeks and asparagus are prebiotic foods that contain high levels of inulin, a soluble dietary fibre that feeds gut bacteria. Another way to boost fibre, according to microbiologist Giulia Enders, author of Gut, is to allow cooked potatoes and wholemeal pasta to cool, which increases their ‘resistant starch’, a form of fibre. Eat them in a salad or reheat if you prefer. Probiotics or ‘good’ bacteria are found in fermented foods such as Greek yogurt, the cultured milk drink kefir (available from Tesco), sauerkraut, kimchi (a Korean cabbage dish available from Sainsbury’s), soy sauce and miso soup. Kefir enthusiasts can make their own from a starter culture (£5.99 from www.livekefircompany.co.uk). Journalist and writer Rachel Kelly, 52, struggled with anxiety and depression for which she had briefly spent time in hospital. She changed her diet after her GP told her of compelling evidence linking mood and food, and later went on to write The Happy Kitchen: Good Mood Food with nutritional therapist Alice Mackintosh. ‘I wasn’t an unhealthy eater,’ Rachel says, ‘but I did like diet colas and cooked fairly basic food. After my GP wrote a list of “happy” foods - including green, leafy vegetables, dark chocolate and oily fish - I began researching and changing my approach. ‘Within a week, I had a new spring in my step. Friends remarked I looked well and seemed jollier. It was exciting to feel this was something I could do for myself rather than having to wait for doctors’ appointments. Of all the research I looked at, I think that eating a varied diet to improve gut health is the most important message. It isn’t easy, but if you have new foods in your kitchen you’ll find ways to use them.